The loading image for RPG Maker MV is static, meaning when a game freezes, it's hard to tell if it's still going or not. Having an animated loading image not only tells the player if the game is frozen, it also looks better, and can distract the player from the actual wait time. This plugin lets you make a spritesheet animation to use as your loading image. Instructions will be explained below. Once it reaches the end, it will loop back around and start at the very first frame again before continuing forward. The X and Y positions will determine where the loading image appears and is centered upon this exact coordinate. If you use 'auto' without the quotes, the plugin will automatically center it at the middle of the screen. Determine how many columns and rows the loading image sprite sheet is. Look at the instructions section above to see how the frames are utilized and how to set them up for your game. 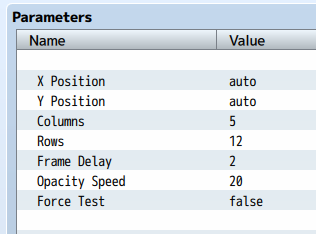 This determines how many in-game frames to delay before moving onto the next image frame. This is how fast the loading image will fade in or out. Use a number between 1 and 255. 1 will be the slowest. 255 will be the fastest. Since some games have relatively fast load times, it's hard to check if your loading image is working properly. Turn this on to test it by forcing the load image to appear in your game. Just remember to turn it off.